Before, I used to buy baby and kids things for my nieces and nephews, but this time, I am buying those for my own kid. I am currently 22-weeks pregnant for our first child. With being pregnant comes with the joy of shopping those cutesy little things for our baby. And last January 28, my sister accompanied me to the Grand Baby Company Fair at SM Megatrade Hall. I had fun buying a lot of things that I ended up paying much more than the budget I allocated for that day. But it was all worth it, as I was able to buy most of the important things that my baby would be needing as soon as I gave birth on June. And all at a very discounted price. With my shopping at the fair, I also got my first ever Mom Card. It was just recently launched by the Baby Company and I am happy to be one of the firsts to avail it. 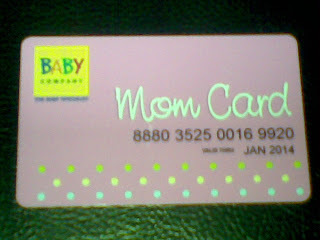 "The Baby Company Mom card is a membership loyalty program that rewards customers with points for every purchase in SM Department Store and Baby Company stores. Exclusive privilege and treats are also given to members such as: discounts and freebies, VIP access to special events, tips from Mom and Health Experts, members-only sale events." I still have a lot of things to buy before I give birth and I am pretty sure that the Baby Company Mom Card would be one of my must-haves in shopping. I am pretty sure I will be able to maximize the benefits of this card.